Growing up with Ernie Els as his uncle, Jovan Rebula was bound to catch the golf bug. And if his showing at the first major of the year – the prestigious Masters, currently being played at the Augusta National Golf Club in Georgia, US – is anything to go by, the bug got him good. Although he failed to make the cut, the 21-year-old showed in the first round that he could well be the future of South African golf. His round of one-over 73 included four birdies and allowed him to leave experienced players – including former champions Danny Willett (2016) and Jordan Spieth (2015), as well as world number one Justin Rose – behind him. Rebula will remain an amateur until he finishes his studies at the Raymond J Harbert College of Business, located at Auburn University in Alabama in the US. The youngster, whose mother, Carina, is Els’ sister, grew up in George. He started playing at an early age and soon showed that the talent that obviously ran in the Els family had not passed him by. He earned his ticket to the Masters by winning the British Amateur Championship in June, becoming the first South African to do so since 1966, when Bobby Cole won. As British amateur champion, he was also invited to participate at the British Open at Carnoustie the following month, but he was in double figures on the wrong side of par after two rounds and failed to make the cut. However, he did gain experience – experience that helped him do much better on the difficult Augusta National. He was probably as prepared as he could be going to the first tee on Thursday. “I have been speaking a good bit to my uncle these past couple of days, and the thing I took away was that he told me I am a good golfer and I am there for a reason. That gave me a little bit of belief. 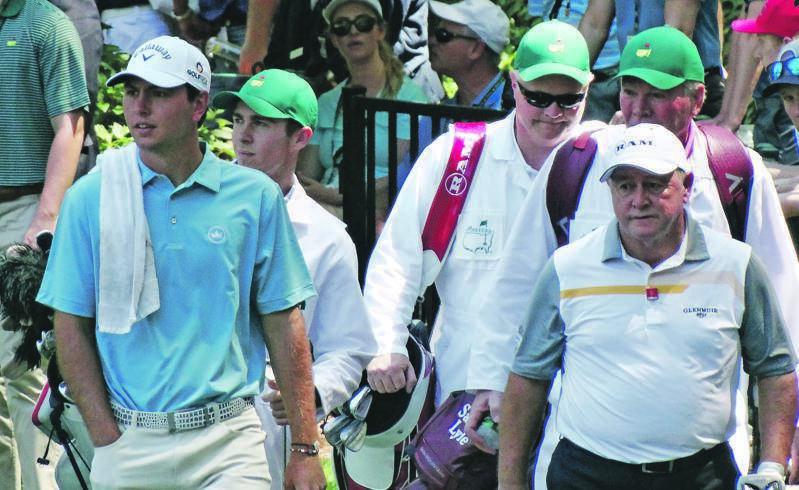 Rebula also got advice from the many experienced South Africans – such as Louis Oosthuizen, Charl Schwartzel and Branden Grace – who were competing at the Masters. Of course, this helped prepare him for the first round, but he still had to go out and play on his own. Fellow golfers such as Els, Grace and Schwartzel were not the only ones who helped Rebula along the way. Rebula is so family-orientated that he even turned down the opportunity to stay at the Crow’s Nest – the accommodation at the Augusta National Golf Club clubhouse for amateur players competing at the Masters. The rooms in which the players sleep are steeped in history and are adorned with photos of past amateurs who have stayed there, including Jack Nicklaus, Tommy Aaron, Tom Watson, Ben Crenshaw, Craig Stadler, Mark O’Meara, Phil Mickelson and Tiger Woods – all of whom went on to win the Masters as professionals. It is not the first time that Rebula did something for his family. As a 14-year-old, he won the Serbian International Amateur Championship, coming back from eight shots behind in the final round to beat long-hitter Ilija Djurdjevic in a play-off. “My father is Serbian and I did it for him,” he said at the time.